Floyd Mayweather stops Conor McGregor in round 10th to win his record 50th professional fight and keep his incredible unbeaten record. McGregor started slightly better but Mayweather always looked in control in what was a very underwhelming fight. If you missed the live action, we will have fight highlights video here couple of hours after its all said and done. Check back in a while . Floyd Mayweather and Conor McGregor are set to take on each other in what is billed as one of the biggest boxing fights of recent history. The build up has been great leading up to the Saturday, 27th August 2017 fight which will take place at the T-Mobile Arena in Las Vegas. The official weigh-in which is a big event in itself takes place on Friday night and we will have full replay video of the weigh-in right here while if you missed the live action of Mayweather vs McGregor fight on Saturday night you can always tune in here for fight highlights afters its all said and done. Floyd Mayweather vs Conor McGregor Official Weigh-In: The weigh-in event is scheduled 24 hours before the fight on Friday night and it will be taking place at around 06:00 p.m EST / 11:00 p.m uk time. The weigh-in is set to be broadcasted on both Showtime and Fox channel in the US while UK viewers can watch the weigh-in live on SkySports. However if you don’t have access to TV channels you can also watch live stream of the official weigh-on on Showtime youtube channel. 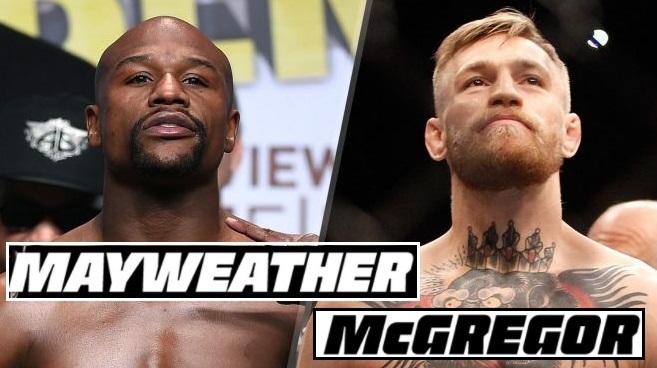 It all started with McGregor poking Mayweather every now and than back in 2016 and within a year talk of this mega fight became more intense and eventually it was announced in in May 2017. Since than build up has been great and Conor McGregor has been running his mouth on every tour and press-conference leading to the fight. Mayweather Jr on the other hand looks more composed than ever and widely expected to win the fight with ease. However he has put himself in a position where a surprise defeat might tarnish his legacy of not only incredible unbeaten streak but also his overall image of one of the all time great boxers. Mayweather is still odds on favourite to win the fight (rightly so) and McGregor will also be happy with a defeat considering he has never fought in a boxing ring professional before and he is set to pocket $75 million guaranteed from this fight. So regardless of the result both fighters are the winners come the end of the night and its safe to say this fight is nothing more than a glorified exhibition fight between a bona fide boxing great and a MMA fighter.